Place ginger, flour, dates, vanilla, molasses together until it forms a rough crumble. (Thermomix 30/speed 6). Place in dehydrator for 6 hours* or until slightly crunchy. 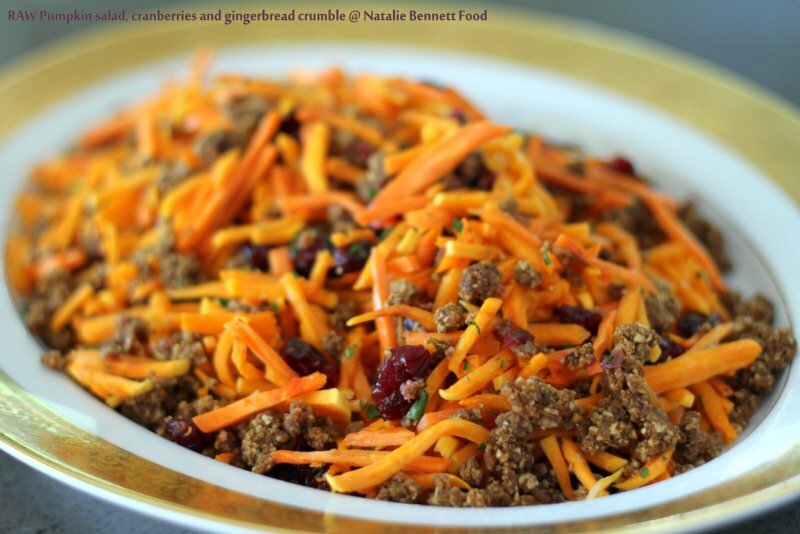 Peel and julienne carrot and butternut pumpkin, place in a large metal bowl, toss through cranberries and finely chopped parsley. I make RAW flour from buckwheat groats or raw steel cut oats. Buckwheat is gluten free and contains rutin, a glycoside, has been known to strengthen capillary walls and improve circulation. Oats is a slightly different story, technically all oats do contain gluten, but it’s a type of gluten called Avenin that is different to the type of gluten you find in wheat, rye, barley and triticale. Coeliac societu of Australia say about 4 in 5 people with Coeliac Disease can tolerate oats. So I leave it up to you which you think is best for your body or to try both.